All your solutions for your act! needs in one neat add-on. Impact Suite bring you power, flexibility and features not found in native ACT! Impact has 15 add-ons to fit your business needs. Purchased separately or together they make ACT! work for you! 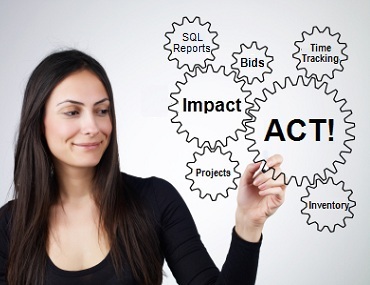 Impact allows you to create new lists such as invoices, bids, inventory and billable hours directly in your database. Shared policy numbers with all users on the network. Import your lists from existing Microsoft Excel files. Start with one of our 30+ templates or create one for yourself. Install our 'Project Tracking' template to attach multiple activities into a common project. Display project information such as 'project name' or 'due date' on the calendar. Once the activity is attached to a project a new customizable icon is displayed. The in-line filter and query builder allows you to design a single or a multi condition (advanced) query. A query is a method of filtering the list. Once you have designed a query, the list will be filtered on those conditions. Building your data-entry form will never be easier. We have 18 standard field types such as character, date, decimal, memo, numbers and yes/no fields to choice from. We have included parent-child fields, container controls like tabs and group boxes, custom controls for multi-line, currency or incremental number generation. Impact allows users to create documents based on templates designed using Microsoft Word. 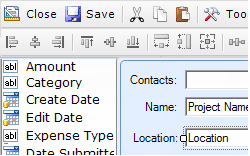 Impact has an add-on designer for MS Word to simple access all the fields in the ACT database. The templates can merge any information in a custom table and/or the parent contact records. Word templates can also be converted to PDF. Allows you to extend the fields on the activity form. You can now add fields to each activity to track mileage or any other field you desire. 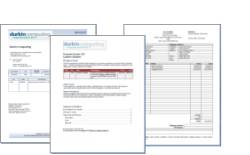 Create invoices in seconds using a pre-determined bundle of products. Impact Suite bring you power, flexibility and features not found in native ACT! Multiple invoice templates quickly converted to ODF and automatically attached to an out-going email saves you time. 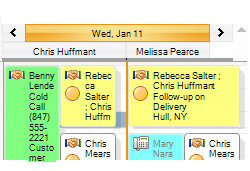 Using Impacts calendar add-on you can color code and enhance the calendar view allowing you to display side-by-side. 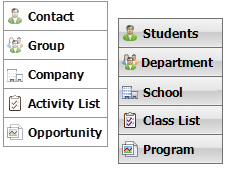 Select from any contact field such as the ID/Status or email address. Color rules are designed to colorize records for rows that match a condition. Color rules can be based on text condition like the one below. In this color rule we are making all rows blue where the word "Triumph" appears in the MAKE column. Administer the add-on from any workstation. Simply log into the ACT database as the database administrator and set each users designer, runtime or bypassed setting. Don't like calling your customers 'contacts' or are you using the opportunity section to generate bids. Then change the display name for existing tables to a name your company uses.